Each Thursday we'll be blogging about a different charity that we met at Winter CHA 2012 and sharing with you what they do - and how you can get involved. We want to share the love, since we know lots of our readers do lots of different kinds of crafting! The Portable Playhouse is a fantastic organization we'd like to introduce you to this week. Maryann, their CEO, is such a charismatic woman, and impressed us to no end! Their organization provides a specialized and unique art program to pediatric units in hospitals and outpatient cancer centers. They create a happy, healthy environment for children & women to nourish their spirit through artistic expression. Their well-trained volunteers go to hospitals - visiting people in the midst of often the scariest parts of their treatments - and get out a toolbox full of beads, Silly Millie, and a smile...and let the patients make a bracelet or necklace for themselves. The patients pick out their own beads, and make the item themselves if they're able...or the volunteers do it for them. 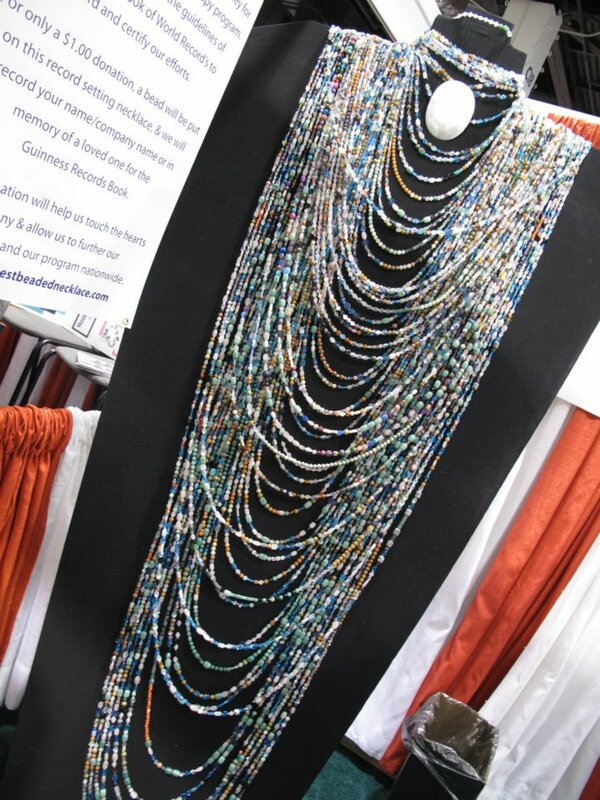 Then they have something truly beautiful to wear, and every time a doctor, nurse, or family member enters their room and comments on their beautiful beaded piece, they absolutely light UP! Over and over again, they have a reason to smile. Please take a moment to watch this video - but go get kleenex first! 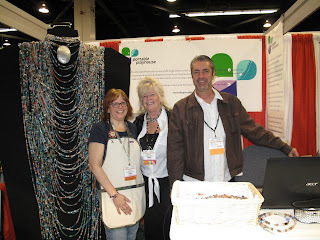 At CHA they had an amazing giant necklace, pictured alongside us, and they allowed people to put a bead on for a donation - they register a name for each bead, and we have an OWH bead that is #12,883!! The beads that the Portable Playhouse uses with the patients aren't those cheap ponybeads either. They are really really nice expensive ones, and make gorgeous jewelry!! They follow our same principle in that way: they provide only the best for their patients, just like we only send the best to our heroes! I personally plan to clean out that bead box I have from the days when I used to make jewelry, and I'll send them to Maryann and her team. I'll give my ponybeads to another group - but all my expensive gorgeous beads go to the Portable Playhouse! Please join me in doing so - or go make a financial donation to help them in their work. Beautiful! Bead-u-tiful! It's interesting in the video when they mention that the young patients are often away from their families for a long time missing important dates like birthdays...much like our deployed troops. Blessings to all.